Tools are awesome. They enable people do jobs that would otherwise be severely impractical and inefficient, like pounding a nail into wood. Not fun when all you’ve got to work with is your bare hands, so people invented an object that you’d hit the nail with instead of your hand, and it caught on quickly. I guess you could just use a rock, but then it still counts as a tool, and what rock comes with the nail remover built-in? My vote goes to the hammers. But today’s subject goes not to the active tools, but to the passive tools like cup-holders and backpacks. Things that always do what they’re built to do, even though they’re essentially doing nothing at all. Most ancient tableware is found relatively close to the living environment of whoever crafted it, usually close to other creations of the same kind, usually in pieces. This vase was found alone under an overhang of rock a fair distance away from any ancient settlements. The people who discovered the pot, several archeologists from the Colorado Plateau Archeological Alliance, thought it was just an odd rock formation at first, but on closer inspection they found that it was a half-buried, intact vase. It was about a year before the Bureau of Land Management let them dig it up and run tests on it. Tim Riley, Ph.D. and Curator of Archeology at the USU Eastern Prehistoric Museum says that the pot is of Freemont make, and is obviously more so because it was found in Freemont territory. He stated that finds like these are extremely rare, because the Freemont civilization started declining around 900-1000 AD, meaning that this pot could well have been made over 1,000 years ago. 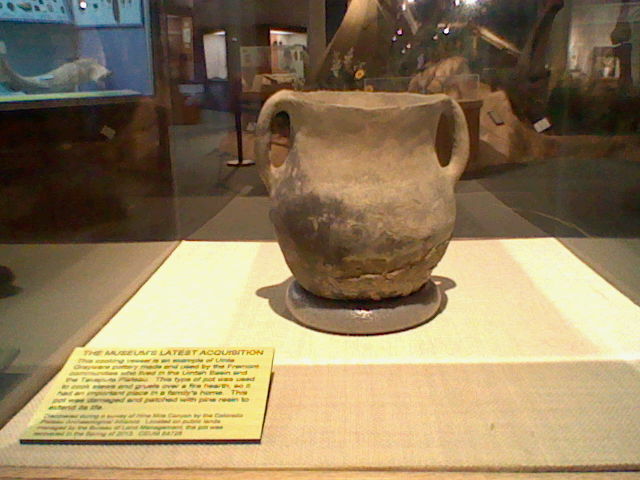 The pot is on display at the museum in the Hall of Archeology. That’s not all at the Prehistoric Museum. On Saturday, Septemer 27th, Smithsonian Museum Day Live is planned. Everyone gets in free, so make sure you don’t miss this fun, educational opportunity.